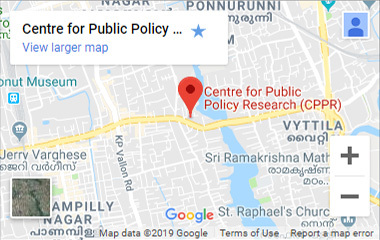 CPPR 15th Quarterly Lecture, ‘Governance and Politics – Need for a New Paradigm’ to be delivered by Dr Jayaprakash Narayan (Social & Political Reformer and former IAS & MLA) on November 22, 2017 from 5 pm to 7 pm at the Grand Hotel in Kochi. Dr Jayaprakash Narayan served in the Indian Administrative Service (IAS) for 16 years. After resigning from the service in 1996 to build a reform movement, he served in several capacities – as MLA and as a member of National Advisory Council, Second Administrative Reforms Commission and Vigilance Advisory Council. He is the General Secretary of the Foundation for Democratic Reforms. As a civil servant, he acquired a formidable reputation in the erstwhile State of Andhra Pradesh and is known for his contributions to agriculture, irrigation, hi-tech city development and economic restructuring, and youth rehabilitation projects in the state. As an advocate of governance reform, Dr Jayaprakash Narayan launched several significant and durable initiatives to make ethical and rational politics sustainable, enhance transparency and accountability, liberate cooperatives from bureaucratic clutches, empower local governments and stakeholders, improve delivery of education and healthcare, and ensure speedy and efficient justice.